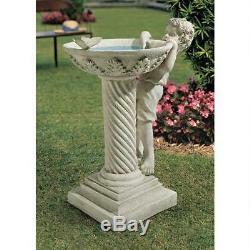 Birdbath Bird Bath Boy Statue Pedestal Garden Sculpture Yard Ornament Art Deco. We've never seen a boy who could pass a puddle by! Our young lad climbs barefoot to peek over the wide rim of our pedestal birdbath and mischievously splash a graceful butterfly in this perfect sculptural celebration of childhood summers. Cast in quality designer resin and hand-finished to replicate fine stonework. Blue water in basin is for prop purposes only not included. Butterfly is a separate piece; please locate butterfly before discarding packaging. Overall: 31" H x 23.5" W x 16.5 D Overall Product Weight: 28 lbs. Includes: 1 (One) Birdbath Customers are encouraged to bring in items during severe weather conditions or to spray items periodically with clear coat protection to extend the life of the finish. Please contact me first to process any return with the supplier. Customer service is our TOP priority! Items must be in original condition and packaging. Return processing time generally takes a few weeks. Replacements are sent out upon receipt of damaged product. Acceptance of merchandise is final only after inspection. No used merchandise will be accepted. Thank You so much for your Business. The item "Birdbath Bird Bath Boy Statue Pedestal Garden Sculpture Yard Ornament Art Decor" is in sale since Wednesday, March 14, 2018. This item is in the category "Home & Garden\Yard, Garden & Outdoor Living\Bird & Wildlife Accessories\Birdbaths". The seller is "shoppingsated" and is located in Elk Grove Village, Illinois.